The New Snow White AutoWah (GB) is a combination of the previous Snow White AutoWah and the Snow White Bass AutoWah pedals. Now both of those fabulous auto wah sounds are in the same pedal making the unit even more versatile. 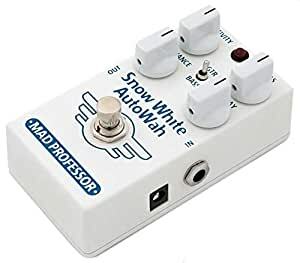 Snow White AutoWah (GB) has a very fast tracking and accuracy rarely found on autowah/envelope filters. With the four knobs you can have a total control of the effect. SWAW works both with both guitar and bass and you can fine-tune the pedal to suit your instrument, your playing style and your taste of tone. The pedal has a unique decay control for the filter frequency fall speed. You can set it to be fast for wah effects on every note, or slower for a more traditional auto wah sound.